At Hands-On Healing, I offer a comprehensive therapeutic approach that I have developed over three decades of clinical practice and education. Combining my skill as an Orthopedic Clinical Specialist and Doctor of Physical Therapy, with years of practical experience assessing and treating peoples’ painful dysfunctions, my unique abilities have evolved beyond the scope of any one of my professional licenses. 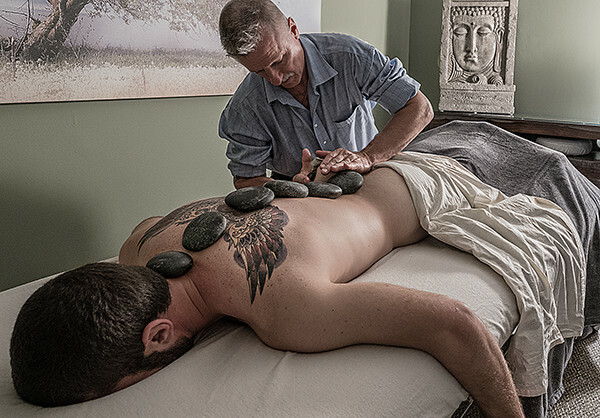 Being Nationally Certified in Therapeutic Massage and Bodywork has cultivated my healing touch into a comprehensive approach to the body, guided by my medical training, skilled and sensitive hands, and strong intuitive insights. With years of clinical experience, I have helped individuals of all ages, having a great diversity of challenges, to create the optimal improvement in their health and functional capabilities. Essential in this approach to healing is the core practice of open-hearted listening and responsiveness to each individual’s expression of their well-being. Always seeking to provide comprehensive care guided by established clinical outcomes and standards of practice, I am continually acquiring new skills and knowledge in the healing arts. As one of the first four physical therapists licensed by the State of North Carolina to practice treatment with dry-needling, I significantly improved my ability to assess and treat painful myofascial trigger points in muscles. Seeking to further my therapeutic intervention with correction of skeletal imbalances, I became a Certified Manual Therapist, skilled in the mobilization of the spine and all extremity joints. With appreciation of the interdependence of all tissues and organs within the body, I became a practitioner trained in using Frequency-Specific Microcurrent to effect healing of all tissues at a cellular level. I have also gone on to further train in manipulation of the visceral internal organs, effecting an approach to encouraging the optimal health and function of each. With gratitude and appreciation for the training and education I have received, I continue to be compelled in my pursuit of excellence as a healer. Given the extremely rare and valuable opportunity to study and travel with indigenous healers from the high Andes mountains in Peru, and with exiled Tibetan elders living in refuge in Nepal, my perspective and healing practice have exponentially expanded. Humbled by the gift of such precious teachings, I continue to integrate these ancient wisdom practices with modern allopathic medicine in an unparalleled healing approach, now available to you. The evolution of my career and healing practice has resulted in the opening of Hands-On Healing in north Asheville. A small private healing environment suited to the extremely personal and individualized attention that I share with all of my clients. Having constructed a facility capable of holding each individual’s healing experience, I am fully empowered to offer from the great scope of my practice and abilities the time and personal attention essential in the creation of a comprehensive and specific evaluation and treatment approach for each individual.